Family Tree Maker is Ancestry.com's powerful package for creating, managing and sharing your family tree. There are many ways to get started, from entering your initial details manually, to importing an existing tree from GEDCOM or PAF files, Legacy Family Tree or The Master Genealogist. Family Tree Maker works best with Ancestry.com, though. Connect it to your Ancestry account and you'll see all the trees you've created, and be able to download and view any of them (media files, too). 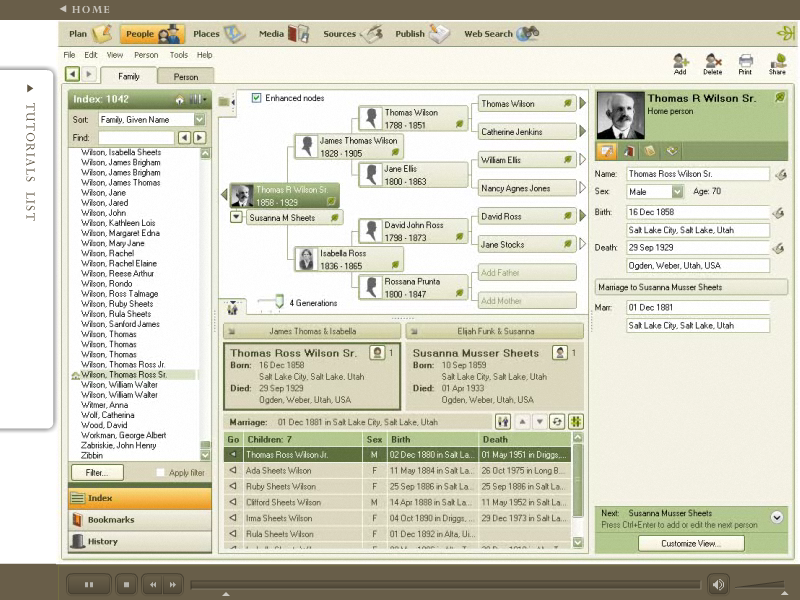 However you create your tree, Family Tree Maker allows you to view it, search Ancestry, Rootsweb.com or the main search engines for more information, add new facts, media and more. If you're used to managing an Ancestry tree online then you'll notice all kinds of helpful extras. You can add web links to a person, for instance. Set up "tasks" as reminders of work you need to do. View all the places your ancestors lived on a map, find and replace text across everyone in your tree in a single operation, calculate the relationship between any two ancestors, and more. You don't have to worry about transferring data between Family Tree Maker and your Ancestry account, because the program handles all that on its own. Any change you make in one place is automatically synced with the other. Perhaps most usefully of all, you can generate a huge number of charts and reports right from your own PC. There are Pedigree, Descendant and Relationship charts, Hourglass, Bow Ties and Fans, Ahnentafel and Descendant reports, individual and place reports, media and source details, even combine just about everything you have in a Smart Story or Book. Note that Family Tree Maker Deluxe 2014 includes a 3-month 'Essentials' membership to Ancestry.co.uk. Australian users are entitled to a 3-month ‘UK Heritage Membership' to Ancestry.com.au. 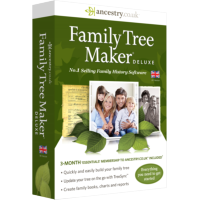 Family Tree Maker Deluxe 2014 is only suitable for customers within the United Kingdom or Australia, due to the Ancestry partnership.